Ah! There it is. This one is a toughie! This is the Vredefort Crater. It is one of the oldest (about 1.97 billion years old) and largest (original size about 90 miles across) craters known on Earth. Because of its age, it is heavily eroded, and only about half of the inner ring of the crater can be seen at all. 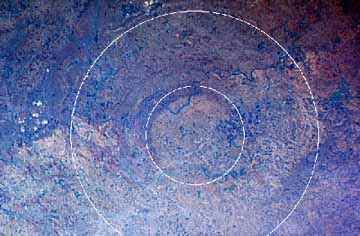 The huge outer ring is difficult to detect from space, and is known mostly from exploration on the ground.